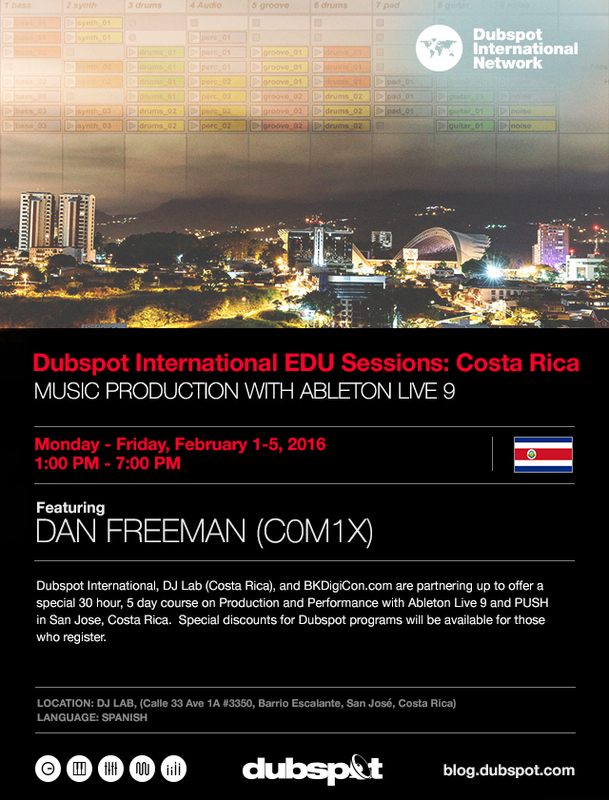 February 1st-5th, join Dubspot Instructor Dan Freeman (C0M1X) for a special Dubspot International workshop in San Jose, Costa Rica on music production and performance using Ableton Live 9 and PUSH. Dubspot International, DJ LAB (Costa Rica), and BKDigiCon.com are partnering up for the first time in San Jose, Costa Rica to offer a special 30 hour, 5 day course on Production and Performance with Ableton Live 9 and PUSH. This course will be taught in Spanish by Ableton Certified Trainer and Director of Dubspot International, Dan Freeman (CØm1x). Special discounts for Dubspot programs will be available for those who register. Students will receive credit at Dubspot so that those who wish to continue with Dubspot’s 6 Level Ableton Producer Certificate in New York or Online can begin at Level 2. Enrolled students will receive a 25% discount off any courses offered at Dubspot NYC and a 50% discount on any online course they wish to purchase. Enrolled students will receive a Certificate of Completion with the Dubspot International and 101 Training Logo. One attendee of the course will qualify to win a free Dubspot online Ableton Live Course. For more information, visit the Facebook Event course page here.